Front view of Banks Street house after renovation. Upstairs porch was opened up and original porch railings recreated. Our 2004-2005 project house is a huge two family built in 1895. Its architecture is transitional Victorian of the late Queen Anne period into the Shingle style that became popular in the late nineteenth century. The interior architecture is solidly Greek Revival but the exterior is more of a shingle style massing with Greek Revival detail. We are converting it from a two family house to a two unit condo. It has a great layout that separates the public spaces from the private spaces very well. We restored the front entrance and porches with their original shingle style and Greek revival details. The house is on a corner lot of a tree-lined street. It’s less than one block walk to Porter, a six minute walk to the Davis Square Red Line, and two blocks to the Minuteman Bike Path. It’s a fifteen-minute bus ride to Museum of Science, Galleria Mall and Lechmere. The first unit is a 2 bedroom, 1 bath with 1050 square feet and is on the first floor. It has 5 rooms and about 400 sq ft of private basement storage. Every surface has been restored. We saved the Victorian proportions and Greek revival details on the interior, including high ceilings, a columned arch between front and rear parlors and a built-in pine hutch. There is a private garden in the rear and a large shared front porch at the front entrance. The second unit is a 5 bedroom, 2 bath with 1750 square feet and is on the second and third floors. It has 8 rooms and 600 sq ft of private basement storage. .The second floor layout is the same as the first with two bedrooms and a bath. The third floor has two more bedrooms and a master suite with a 7’ x 14’ walk-in closet and a laundry. The dining room has a decorative fireplace with a restored bronze faceplate and there is a built –in hutch in one of the bedrooms. We found a secret compartment in the hutch, but it was empty. There are private front and back porches and one deeded parking spot next to the garden. View from front parlor looking into dining room and kitchen behind. Original mantle was moved to the left and a breakfast bar was added between dining room and kitchen. First floor dining room after renovation. The hutch was refinished. The wall between the dining room and kitchen was removed and a breakfast bar added. Second floor kitchen after renovation. The pantry was removed and the doorway to the cellar was moved. Second floor bath after renovation. Vanity and water closet switched places so a real door could be used. Second floor kitchen before renovation. First floor dining room and hutch before renovation. View from front parlor looking into dining room and kitchen behind. Second floor bath before renovation. 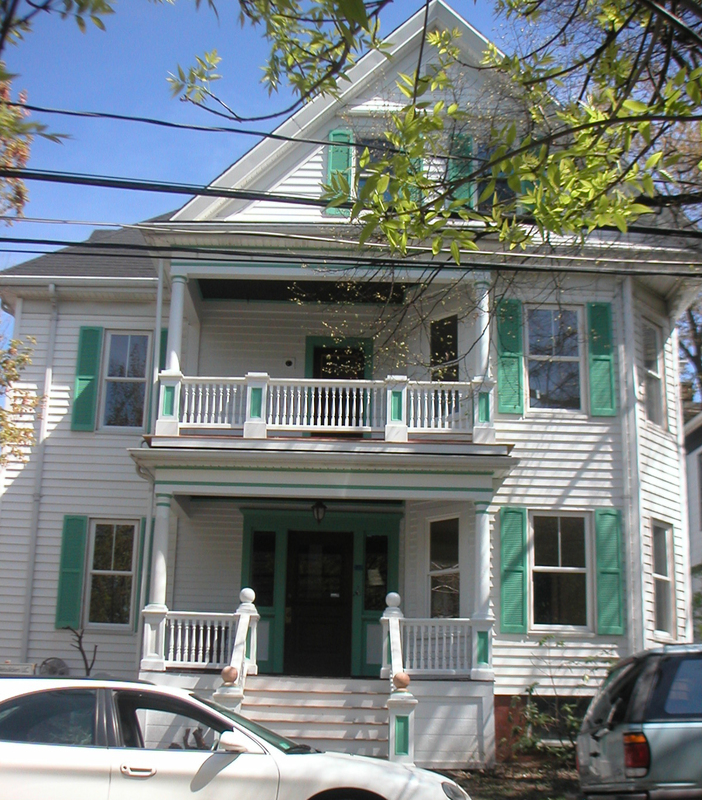 Front view of Banks Street House before renovation.